Laparoscopic sleeve gastrectomy was a part of staged operation for super-obese patients, but with the advent of more restrictive sleeve gastrectomy it could become a single stage procedure in carefully selected patient subset. Various studies have shown that weight loss has been in range of 55% to 70% of the excess body weight. We have studied this procedure over 74 patients . A prospective study of 74 morbidly obese patients who underwent laparoscopically sleeve gastrectomy between January 2007 to August 2009. The inclusion criteria were Body Mass Index ( BMI ) more than 40 without comorbidity or more than 35 with comorbidity. Patients were medically fit to undergo laparoscopic major surgery . They were followed up at six and twelve months. We recorded the weight, fasting blood sugar( FBS ) , Lipid profile , Sodium (Na ) , Potassium ( K) , Calcium (Ca ) , Magnesium ( Mg ) , Uric Acid and blood pressure. We performed laparoscopic sleeve gastrectomy over 32-F bougie. Intra-operative methylene blue dye test and post-operative gastrograffin test was done at day one in all patients. The results of laparoscopic sleeve gastrectomy on 74 morbidly obese patients (BMI average 45.2 kg/m²) showed ; weight loss at 6 months and 12 months, 56% and 72% excess weight loss .Mean weight loss was 28.2kg at 1 year & BMI loss of average patient 10% .Improvement in diabetis control was observed in 72% at 6 months and 78% at 1 year. Hypertension showed improvement in 80% patients at 1 year. Resolution of dyslipidemia was observed at 62% at 1 year. The other metabolic parameters studied namely Na, K, Mg, Ca and uric acid levels did not show any significant change at 1 year interval. The procedure had failure in 5 patients ; who did not show significant weight loss. 1 patient had postoperative leak from gastro-esophgeal junction which was managed conservatively . 3 patients required postoperative ventilatory support for 2 days. 2 patients developed features of pulmonary embolism despite on low molecular weight heparin they improved conservatively. The more restrictive sleeve gastrectomy could become a single stage operation for most morbid obese patients. 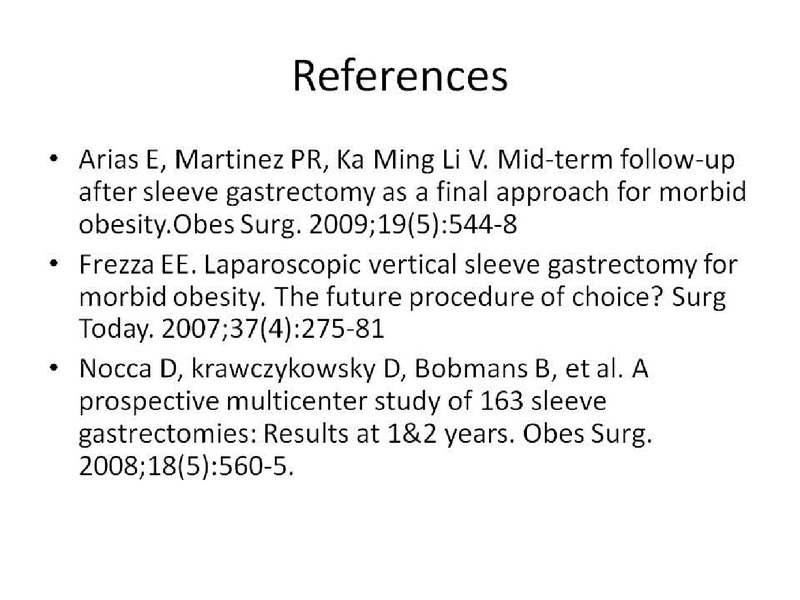 Any failure following laparoscopic sleeve gastrectomy may require re-sleeve or conversion to Roux-en-Y gastric bypass. Patients who underwent laparoscopic sleeve gastrectomy achieved a mean excess weight loss at 6 & 12 months post-operatively, of 56% and 72% respectively. The effect on metabolic syndrome namely the blood sugar levels measured by fasting blood sugar at six months and twelve months showed improvement in 72 % and 78 % . Hypertension showed improvement in 80 % patients at one year. Lipid profile showed improvement in 62% at one year. Other metabolic parameters studied were the same at one year interval.